This piece of Scottish Rite Jewelry is stamped 14K, with some hand engraving on the inside, and opens into 3 different pieces with 4 sides of beautiful enamel work. I don't know much about this. It was an Estate sale piece. What a great piece of Masonic Jewelry! Its versatility is quite ingenious. The first photo displays the Scottish Rite Double Eagle, which is the Scottish Rite logo. 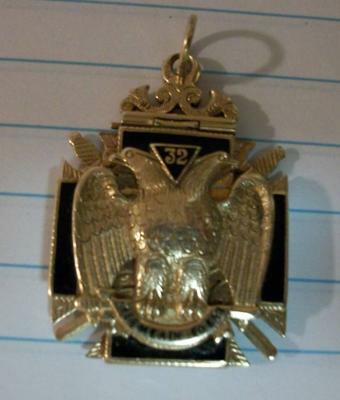 Above the eagle is the number "32", which means its wearer attained the 32nd degree in Scottish Rite. This also means that since each man must first become a Master Mason, the wearer also attained his first 3 degrees, (that of Entered Apprentice, Fellowcraft and then, Master Mason) in his lodge. Afterward, he joined the Scottish Rite, which is an appendant body to Craft Freemasonry, and attained his 32nd degree within that body. Scottish Rite degrees go from 4-32. A 33rd degree is possible to be conferred to a very few, as it is an honorary degree which must be voted upon and only 1 or 2% of all Masons have the 33rd degree conferred upon them. 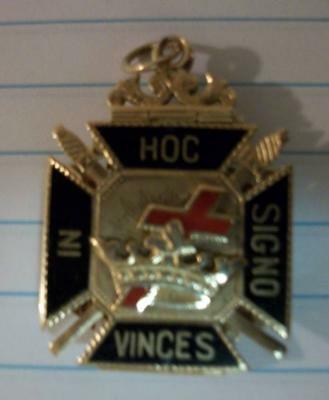 The second photo of this piece of Scottish Rite Jewelry which is bordered in black, displays the red Passion cross, the crown and the motto, In Hoc Signo Vinces. (pronounced In Hawk Signo Win Kace). Today, this symbol is used by the Commandery of Knights Templar, constituting the American branch of the Order. a substantial, but not literal, translation of the original Greek. Historically, this motto has been attributed to Constantine. However, per Dr. Albert Mackey, Masonic author and historian, the ancient Templars did not use the Passion Cross, nor the Cross of Constantine, nor was the motto "In Hoc Signo Vinces" on their standard (banner). They used a beauseant (pronounced "Bo-Say-Ong"), which was a simple banner on their standard pole, which was a half black and half white flag. This is an example of a symbol having different meanings to different people, throughout the centuries. The third photo shows several symbols, (the Masonic trowel of friendship as well as the sword), along with the red cross, once again. Freemasonry is open to men of all faiths, however, the original owner of this piece was undoubtedly a Christian. 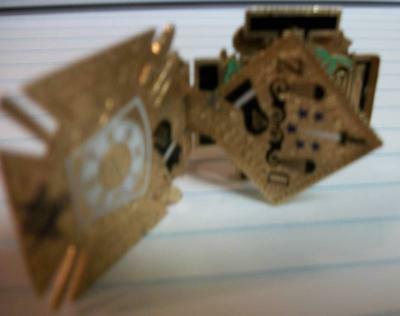 The fourth photo shows HTWSSTKS on this Scottish Rite Pin. HTWSSTKS is an acronym meaning Hiram, The Widow's Son, Sent To King Solomon. This is an analogy to Hiram Abiff, who in Freemasonry, is symbolic of a Master Craftsman. As to the value of this piece of Scottish Rite jewelry, I cannot say, as I am not a jeweler. It is an exquisite and multi-functional piece which, I am sure, would have many members of the Scottish Rite who would be interested in purchasing it should you decide to sell it. Hope this was helpful to you, Rees. Thank you for sharing. Scottish Rite Jewelry With Upside Down Triangle? Why would any self-respecting 32nd degree Scottish Rite Mason purchase jewelry depicting the triangle upside down? It's not correct, the jeweler obviously wasn't familiar with our emblem or just cared more about how it fit into his design that getting it right. Would you purchase a pin or ring that had the 'G' upside down within the compass and square? Hi Mark. I'm really glad you wrote about this because others may also wonder about the meaning of the second, (overlayed) downward-facing triangle, such as seen in Freemasonry's logo symbol, the square and compasses. The upward-facing triangle points upward toward God, the Supreme Being. The downward-facing triangle points to Man, below. Thus, in Freemasonry, the two triangles denote Man's relationship with the Supreme Being and the Supreme Being's relationship with Man. It is this relationship that is the foundation of Freemasonry, and why Freemasons wear the Freemason logo so proudly. Thanks for writing and sharing, Mark. There are probably many people who did not understand this, but were afraid to ask or mention it. Actually, this watch fob is indicative of the fact that the original owner was a member of BOTH RITES of the American Masonic System; the Scottish Rite and the York Rite. Illustrated by the presence of the Eagles Lagash and the Cross and Crown. Return to Masonic Regalia and Jewelry.